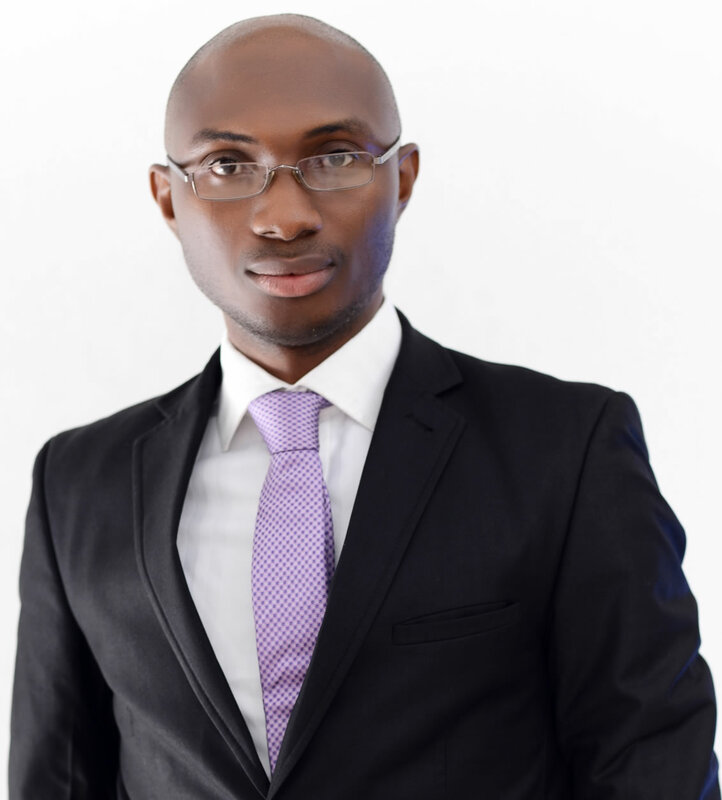 This is the story of a banker who recently has an encounter with a Chinese immigrant in Nigeria. 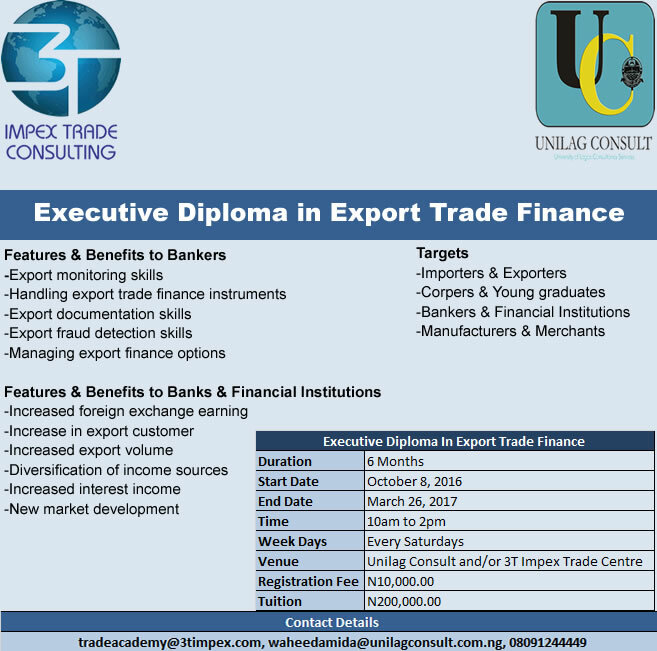 It lays credence to the increase in export activities in Nigeria and hence the need for you to get equipped through this course Executive Diploma In Export Trade Finance and thus become an actor and beneficiary of the profits in the new export trend either as an employee or an employer of labour. Most Nigerians currently feel like hanging Mr. President.Particularly, the importers, due to the dollar rise. I've been feeling the same way too, until I had an encounter with a Chinese guy, and I've tagged my feelings as stupidity. This Chinese guy has a factory where he manufactures furniture here in Nigeria. One of his raw material is wood, which he sources from Nigeria, because Nigerian wood is cheap and of the best quality. But he has to import other accessories. But one of the amazing thing is, since the rise of the dollar, the guy has been importing accessories, yet he has not increased the price of his products. So how come? This guy put his wife in charge of the factory, while he spends most of his time at Shagamu, in Ogun State, buying timber and exporting to China. The money from the exported timber that was supposed to be transferred back to him here in Nigeria, is been used to buy the furniture accessories he uses for production. By so doing, he doesn't need to buy dollar. So he said: "Emmanuel, I don't have problem with dollar rising to N500...because I don't need it for anything." He said his Indian friend does the same thing with ginger export. While the only thing we Nigerians do is exporting our complaints on social media. So the Indians and the Chinese are busy coming up with strategies that have defied the dollar challenge, while we Nigerians are shouting 'dollar is high'. Again it is all about taking advantage of the situation to move ahead instead of just wailing on social media. Let's all start THINKING and DOING even as we criticise government policies we don't like! It was at towards the end of summer in 2014 that I visited the Spitafield market in London, United Kingdom and met a number producer sellers. It was a very interesting visit because it boosted my moral to drive export growth the Nigeria especially the possibility of export fresh farm produce. The market is located on a large expanse of land located at 23 Sherrin Road, Leyton, London E10 5SQ. This market has been described as premier wholesale fruit, vegetable and flower market the largest revenue earning fresh fruit vegetable and flower wholesale market in the UK. Fruits and vegetables arriving in the UK Airport every evening find their way to this market for sales to buyers all over country and beyond. The market is open for trade from midnight to approximately 11 am Monday to Saturday. One major characteristics of this market, which also use it as a focal point in this article, is that, it is dominated by the Asians (especially Indian, Lebanese etc) who constitute more than 50% of the sellers. Another interesting observation I made was that, they import different farm produce (fruits and vegetables) from their brothers in their country into the UK. These have therefore contributed to the tremendous growth in the volume of shipments from a number of Asian economies to the UK and EU. This synergy between our citizens at home and abroad is what Nigerians need to emulate in order to make the current drive for exportation of Nigerian products abroad a sustainable and successful one. The next question therefore is, how do Nigerians at home work with Nigerians abroad to form a formidable team that will start the exportation of Nigerian products and grow it sustainably to an enviable company in the international arena? I will use the lessons I learnt from few of our clients that have used this model successfully to highlight the HOW in this Write-up. There actually three of them. One of them ship to her sister in Ireland, the second person ship to her husband in UK, while the third person ship to his wife in Canada. The first thing to note is that, if this arrangement is going to work in a sustainable manner, it must be at the instance of the exporters in Nigeria who is in dare need of better income, better business, better life and of course the most sought after foreign exchange. Therefore the exporter needs to find a partner that he is very much comfortable with. This trust must be the first factor to be considered. It is the foundation of the Business relationship. Both must agree on their roles, responsibilities and benefits in the business and it will be great if this is documented in a memorandum of understanding (MOU). I will like to recommend that the partner should not be an employee that is doing a 9am to 5pm job but rather an entrepreneur that is self-employ or any person that is relatively free to do the marketing and logistics. Having sorted out the trust issue, the other 3 critical things that needs to be consider is passion, skill and market. Marketing a cross border is very challenging especially when the product is coming from underdeveloped countries. The partner abroad therefore need a lot of passion for the business in order to keep moving and keep push until he breaks through. Passion is what creates the staying power in times of discouragement due to rejections of the products and even the country that produced it. If the passion is there, he will be willing to learn, accept criticism and correct any errors or observations made on the product. 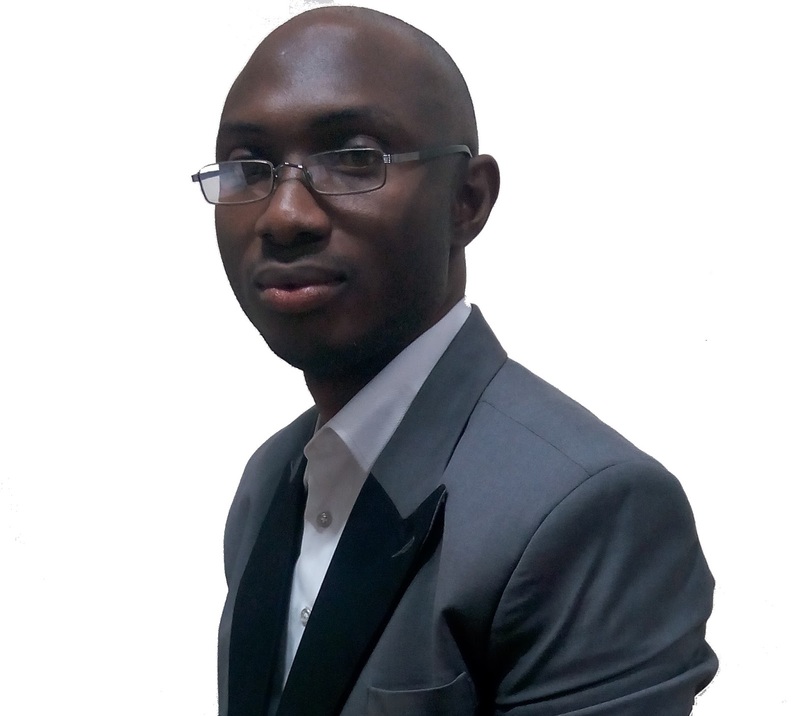 When the issue of passion is settled, the next thing to consider is skill acquisition in the areas of promotion, purchase order, paperwork and payment methods. 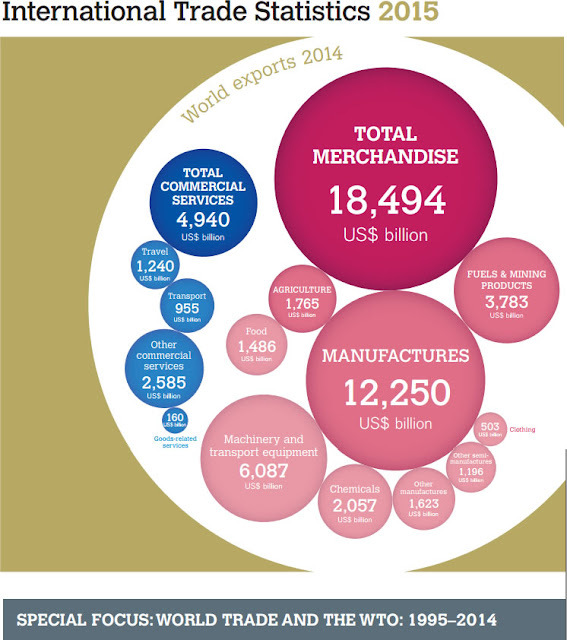 These are different areas of international trade that the partner abroad needs to know. What we have done to assist the partners of our client abroad is to develop a training product that has about 13DVDs and a Book covering different areas of international trade. This can be purchased and sent to the partners abroad for personal development. The international trade business is a very dynamic one with so many things to learn. So there is need for continuous personal development after the foundation have been laid through the initial materials. The last in the three critical areas of consideration is the market. This requires the studying of the market to know the products that are in high demands where we have a competitive advantage in terms of production and pricing. He will need to segment the market and determines the segment he will like to target based on his strength and the perceived opportunities. For this kind of model, starting from the lower class segment and the shops or markets where they go shopping is very critical. This is because, this is the path of least resistance especially if you are doing processed food items, fruits and vegetables. However, if your focus is commodities, you might have to target the manufacturers in the lower cadre of the ladder before going to big ones in the export market. Finally, these 3 critical factors are so essential that, if anyone one of them is missing, the partner will be frustrated out of the business. This is because market plus passion minus skill is equal to dream. Market plus skill minus passion is equal to a job. Passion plus skill minus market is equal to hobby. Lastly market plus skill plus passion is equal to the work you love. So, your partner needs skill to build competence, he needs passion for sustainability and market for the sales and profitability. 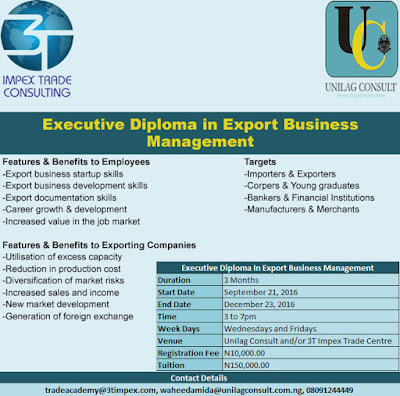 In order to address the current challenges of foreign exchange shortage in our country, the management of 3T Impex Trade Academy (an arm of 3T Impex Consulting) has partnered with University of Lagos to develop and run different diploma programmes in international trade in Nigeria. These include Executive Diploma in Export Business Management and Executive Diploma in Export Trade Finance.These Executive Diploma in Export Trade Programmes have been designed as a professional qualification to recognize competence of international trade and finance practitioners. It will enable the students to demonstrate practical knowledge and understanding of complex issues relating to export trade and finance. It is ideal for people who are new to export, as well as experienced export companies because it will provide successful experts with a thorough grounding in the key areas of foreign trade. 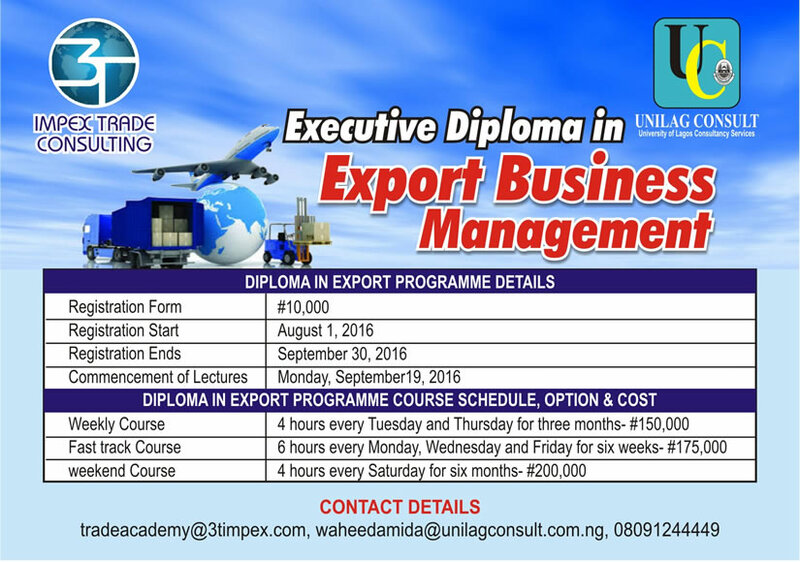 The basic objective of this course is to provide to the country with a steady stream of competent men and women with the necessary knowledge, skills and foundations for acquiring a wide range of rewarding careers into the rapidly expanding world of exportation. 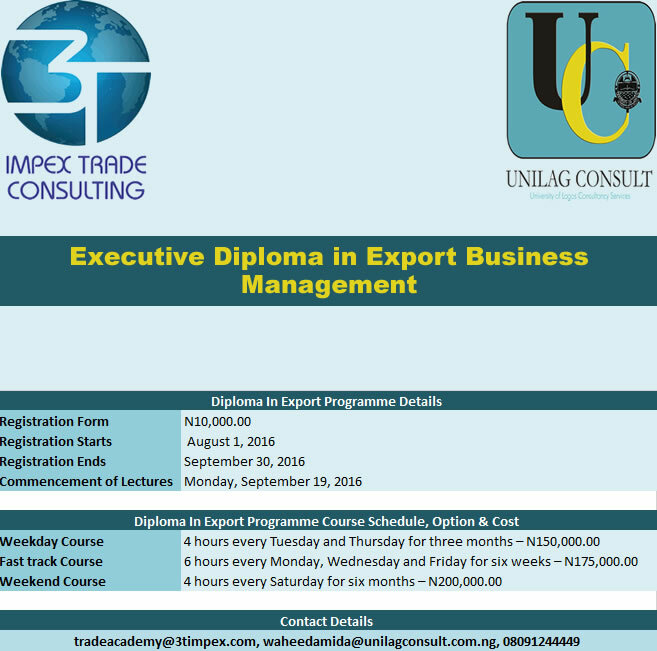 It is designed to provide all the knowledge, tools and techniques necessary to manage all the technical aspects related to export trade business operations and financing. The target market or groups of professionals for these programmes include: Bankers, Commercial Banks, Developmental Banks, Exporters, Importers, Young graduates, Farmers, Miners and Manufacturers. 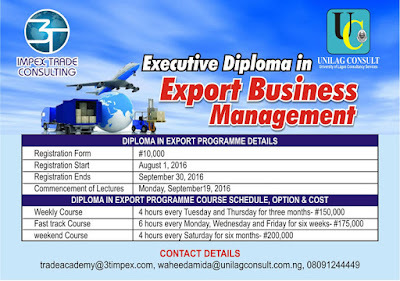 Upon completion of this course, students who are young graduates become a valuable talent for exporting companies and importing companies that are planning to setup an export business. The students with work experience are equipped with skills that empower them to favourably compete for trade related jobs in the global space. Each of the training programme is divided into about 3 modules and each module comprises of about 5-6 subjects or topics that addresses specific area of export trade business. 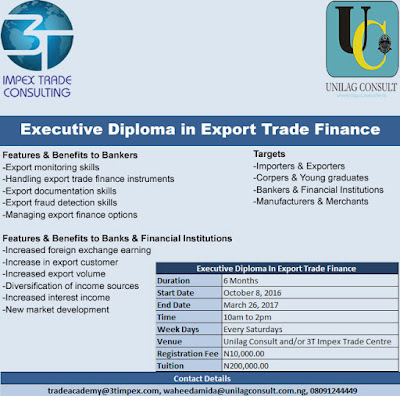 To be eligible to apply for these programmes (Executive Diploma in Export Business Management and Executive Diploma in Export Trade Finance), the student needs to hold a bachelor degree or advance/higher diploma in any discipline with or without work experience especially in banks, importing and exporting companies. The duration of each of the training programme shall be for a minimum of 90 hours (this majorly comprises of class room lectures and interaction with the facilitators). Based on the number of days required to complete these courses, the availability and convenience of the students, we have designed 3 options. A number of states in Nigeria are currently running on avoidable deficit due to our over dependence on oil. 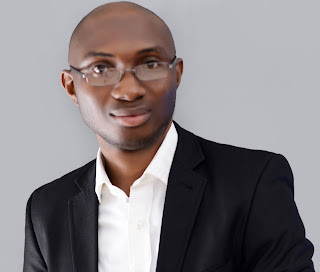 Many of the state governments came into power with the mindset of getting monthly allocation from the federation account but the decline in the oil price vis a vis the destruction of oil pipeline and installations have dashed their hope. In this write-up, I will be focusing on how Kwara state can become financially independent through aggressive drive for non-oil exportation. According to BudgIT, Kwara state is currently among the states in Nigeria that is running at a huge deficit. This is because the total income realisable from both the internally generated revenues and the federal allocation are grossly inadequate to meet the recurrent expenditure talk less of the capital expenditures. My position has always been that all the states in Nigeria has what it takes to internally fund her budget and survive independent of the federal government allocation. 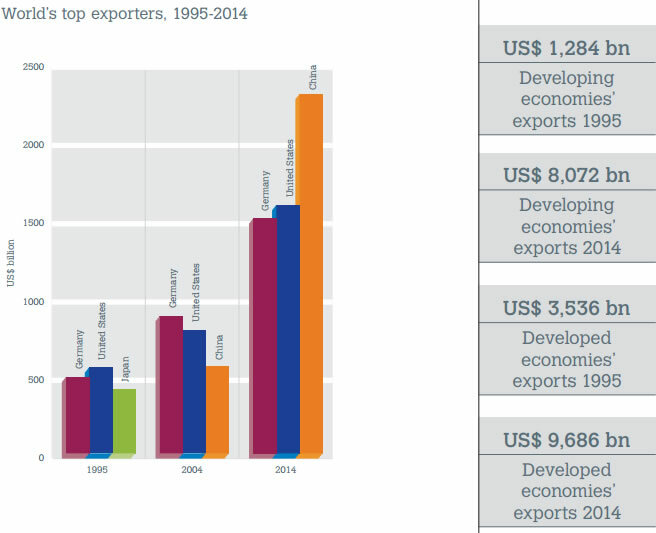 To achieve this, they need to focus on 2 major sectors namely Agriculture and Non-oil export. The strategies put forward in this Article is capable of not just helping the state to generate revenue and become self-sufficient, in addition to this, it will also help them to create numerous jobs for their teaming population. Kwara state is very much blessed with very large land mass that is suitable for the production of different kind of exportable Agricultural commodities, but in this article, our recommendation for this state is Raw Cashew Nut Export. Even though this is a tree crop with gestation of about 2years for improved varieties, but the potential upon maturity will last for many years. According to the Collaborative Survey Conducted by National Bureau of Statistics, Central Bank of Nigeria, Federal Ministry of Agriculture & Rural Development and Federal Ministry of Trade & Investment, this state produced about 39,000MT of Raw Cashew Nut in 2012. Using the national average of about 38%, this state currently has arable land that is about 1,414,080.00 hectares of lands. With a yield of 1MT per hectare, this means that the state can produce 565,632MT of Cashew nut on the land size stated in the assumptions above. If this Cashew nut is exported at a free on board (FOB) price of USD1,000/MT, the total proceeds will be USD565,632,000.00. Using a conversion rate of N310 to 1USD, this amount to N175,345,920,000.00. The unit cost of farming Cashew nut and exporting are N25,000 per hectare and N35,000 per MT respectively. 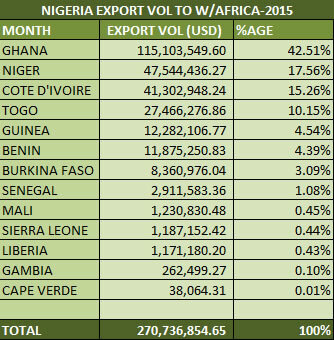 The total cost of farming plus 50% profit on the sales to the government (or to the trading company engaged by the government) comes to N21,211,200,000.00 and the total cost exporting (transport, documentation, freight forwarding etc) comes to N19,797,120,000.00. The total project cost (farming and exportation) will be about N41,008,320,000.00. The estimated profit that can accrue to the state on this project comes to about N134,337,600,000.00. The impact of the suggested model for Kwara state government goes beyond the generation of revenue via export, it will also have humongous impact on employment generation and increased economic activities in the state. This in my opinion is a more effective, efficient and enduring model for diversifying the economy of any state in Nigeria. This article therefore was written to show the state a way out in practical sense with the numbers that are well researched and not just speculation on what could be done. This article is a departure from what our leaders are used to. They make promises of projected internally generated revenue and jobs to be created. They give us numbers which have no foundation, no basis and are therefore not realistic and we the citizens have failed to ask the question "HOW". We are usually indifferent and do not bother about the specifics. Then, they get elected and begins to tell us their challenges and why they cannot fulfil their promises. With a yield of 20MT per hectare, this means that the state can produce 2,374,118.40MT of sugarcane on the land size stated in the assumptions above. If this sugarcane is exported at a free on board (FOB) price of USD600/MT, the total proceeds will be USD1,424,471,040.00. Using a conversion rate of N285 to 1USD, this amount to N405,974,246,400.00. 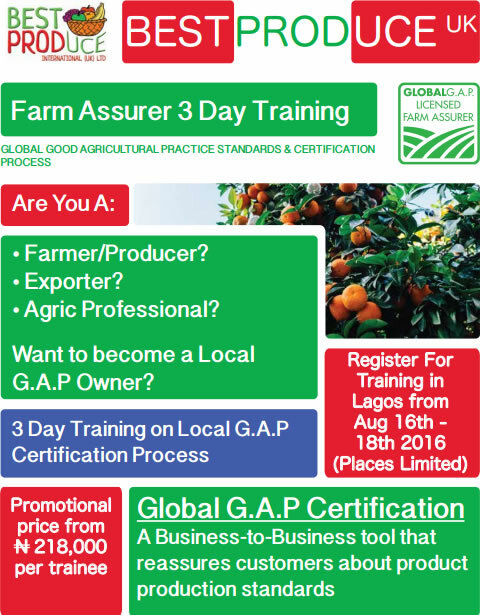 The unit cost of farming sugarcane and exporting are N250,000 per hectare and N40,000 per MT respectively. The total cost of farming plus 50% profit on the sales to the government (or to the trading company engaged by the government) comes to N44,514,720,000.00 and the total cost exporting (transport, documentation, freight forwarding etc) comes to N94,964,736,000.00. The total project cost (farming and exportation) will be about N139,479,456,000.00. The estimated profit that can accrue to the state on this project comes to about N266,494,790,400.00.